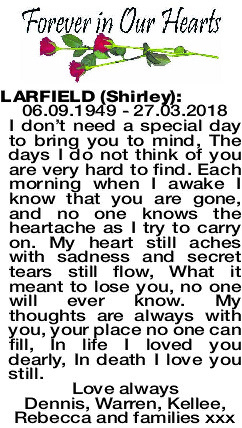 LARFIELD SHIRLEY 06.09.1949 - 27.03.2018 I don't need a special day to bring you to mind, The days I do not think of you are very hard to find. Each morning when I awake I know that you are gone, and no one knows the heartache as I try to carry on. My heart still aches with sadness and secret tears still flow, What it meant to lose you, no one will ever know. My thoughts are always with you, your place no one can fill, In life I loved you dearly, In death I love you still.